Ukraine’s government inquiry found that special police forces were behind the killings of dozens of anti-government protesters in Kiev in February. Interior Minister Arsen Avakov told reporters that 12 members of the Berkut police had been identified as snipers and arrested. Arsen Avakov presented what he said was new evidence from the shootings on February 18-20, when 76 people were killed. Months of mass protests led to the ousting of President Viktor Yanukovych. More than 100 people – including police officers – are now known to have died in Ukraine since the unrest began in November over Viktor Yanukovych’s last-minute rejection of a landmark deal with the EU in favor with closer Russian ties. Ukraine’s new authorities have since signed the political part of the association agreement with the EU. Meanwhile, Russia – which backed Viktor Yanukovych – last month annexed Crimea in southern Ukraine following a controversial referendum branded illegal by Kiev and the West. At a news conference in Kiev, Arsen Avakov presented the initial findings of an initial investigation into the mass shootings that shocked Ukraine and the world. Most of the demonstrators who died were killed on Instytutska Street near the main protest camp on Independence Square, widely known as the Maidan. Arsen Avakov gave details of one particular episode where he said the inquiry had established that eight of those killed were hit by bullets from the same machine-gun. He identified Maj. Dmytro Sadovnyk as commander of a unit suspected of shooting dead at least 17 protesters. 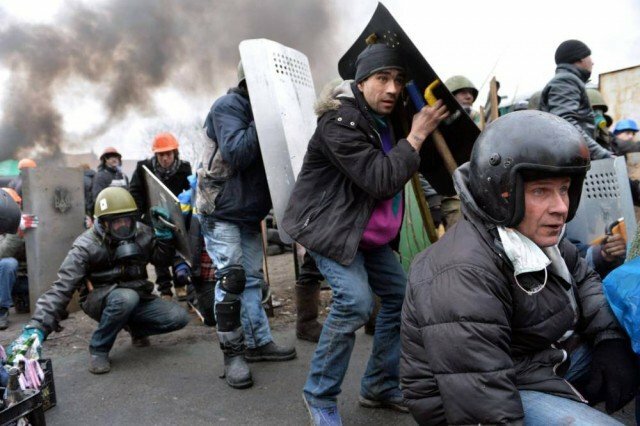 “From the side of the Zhovtnevy Palace, a special squad from the riot Berkut police, wearing yellow armbands, opened fire at the protesters. Much of this fire was targeted. We are carrying out ballistics tests on the weapons,” Arsen Avakov said. Members of the security services’ special unit Alfa are also believed to have taken part in the shootings, he added. The interior minister also showed a number of slides and photos illustrating where he said police snipers were firing from. He named two buildings on Khreshchatyk and Kostyolna streets, saying other spots were still being investigated. And he added that the previous authorities had tried to make the inquiry impossible by burning uniforms, dumping weapons and destroying documents. A number of those responsible for the shootings are believed to have fled to Crimea. Ukrainian Security Service chief Valentyn Nalyvaychenko said that Russian Federal Security Service (FSB) operatives had been involved in planning operations against the protesters. He added that the FSB had sent “tonnes” of explosives and weapons by plane to Ukraine. The Ukrainian authorities also said that the killings of the protesters took place “under the direct leadership” of Viktor Yanukovych. They said arrest warrants had been issued for the ex-president and Oleksandr Yakymenko, Ukraine’s former security service chief. Viktor Yanukovych – who is now in Russia – has repeatedly denied the allegations. In a TV interview on Wednesday, Viktor Yanukovych claimed the shooting in February came from buildings held by protesters.